Wedding invitations definitely do not have to cost a fortune. Ours were less than £3 each but looked professional and stylish. They were personalised with a photo and we had enough (plus extra) for our guests well within our wedding budget. So, where do you start? Let’s start with these five wedding invitation ideas for less than £3 each. This is definitely the cheapest way of doing it. You just need to get the card and material for your wedding invitations and then create the design. A friend did this for her wedding last year. She says that it was hard work at the time but worth it to put her own style to the day. And she was able to make her wedding invites for far less than we did! Start by getting some brown card and white lace. The brown card is the bulk of your wedding invitation idea and you can use the white lace for the boarder. 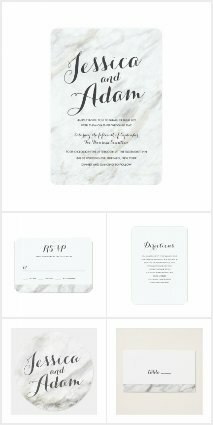 Carry on the style with your RSVP, menu, and other wedding stationary elements throughout the day. Instead of white lace, you can use a colour that works with your wedding theme. Baby pink or baby blue card is also a popular option for those who want something brighter for their day. If you don’t fancy buying the bits and pieces to make your own, you could get a DIY wedding invitation kit off Amazon. You’ll get the paper and the envelopes and you just have to create the writing. Wilton 100-Pack Single Border Invitation, Ivory This helps to add some personalisation and create simple and elegant invitations. The paper is high quality and works with the majority of printers in the home. The cost isn’t that high either for this wedding invite idea. While they’re around $20-$30 for a kit, the per invite cost is less than $3, so definitely less than £3. You’ll get 100 invites per pack! This is actually likely the cheapest option available. Zazzle doesn’t just offer wedding invitation ideas. You can also get a set of stationary to work for the whole day. This is a great way to create a theme around your wedding day without spending a fortune. You can get this marbled wedding invitation set for less than £3 per wedding invite. In fact, two wedding invites are just over £3.30. You can add the RSVP on if you want but this will depend on how you want people to RSVP. We kept the cost down by encouraging people to call, text or email our wedding email account. The marbled wedding invitation is very easily personalised with your own name and wedding details. The only thing I have against it is that a photo can’t be added…I guess I just really like photo wedding invites. Rustic wedding invitations are basic but elegant at the same time. There is so much that you can do with them and most of your guests will adore them. When they think of your wedding, they’ll think about the wedding invite that you sent. There are plenty of rustic wedding ideas available on Zazzle, but this is one of my favourites. I love the section at the side that has the tree with the initials carved in it. Does anyone else remember doing this as a kid? Maybe you’ve done it quite recently…I’m not sure if it is still a thing but it was in the 1980s and 1990s when I grew up. This invite also has a style of an old tree, linking to the heart carved into the tree. The colouring is complimentary. The benefit of this invite is that you can add something to the back of it. This is the place to add a photo of the two of you. Why is a photo so important to me? I could write a whole post about this but the main reason is that your guests will know who to look out for. Some of my family had never met my husband, so they had the photo on the wedding invite to tell who they had to look out for as a groom. If you’re planning a destination wedding or you know a lot of your guests will need to travel, a boarding pass could be an excellent option for wedding invitations. I’ve had two couples send festival style tickets, which the boarding pass style reminded me of. The benefit of the boarding pass is that you can create tear-off sections. There’s the option of including the addresses for all venues on one tear-off section, so guests only have to carry that around. You can also have a tear-off section for the RSVP to make it easier for guests to let you know if you’re coming or not. This is a fun option and a way to make it clear from the start that your wedding is in a different location to where you live. You can even add the name of the location clearly, so people get that destination in mind right away. The boarding pass style is the most expensive out of all the individual wedding invitation ideas on this list, but it’s still under £3. In fact, it’s less than £2 per invitation, depending on the style that you choose. This one is beautiful for those with a beach wedding in mind. The image makes it clear to your guests what the plan is and they don’t have to search far to find out the exact destination. It’s also one of the cheapest boarding pass style wedding invitation ideas! There’s no need to spend a fortune on your wedding invitations. You can spend less than £3 per wedding invitation and still create beautiful and professional-looking invites. Out of the wedding invitation ideas there, which one would you like to use? If I could do it all over again, I’d like to do the rustic style.